Poetry has always had a home in Chicago, a city that has yielded some of the most well-known poets of the last several decades. Carl Sandburg’s career should not be referenced without mentioning his collections Chicago Poems and The People, Yes, verse that praises the common man at the heart of the city of “Big Shoulders.” Rarely is Gwendolyn Brooks mentioned at a conference without reference to Chicago and all she gave to the community through writing workshops. The city still remains a major poetry hub, home to Louder than a Bomb and other youth-centered writing organizations. 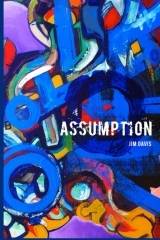 Jim Davis’ collection, Assumption, carries on in the tradition of the Chicago poets that preceded him. His work centers on some of the city’s most overlooked characters, while mix-maxing images that are surprising and engaging, thanks in part to his talent as a visual artist and his attention to fine detail. Davis, editor of the North Chicago Review, has a knack for narratives with characters that mutter odd dialogue, yet have some endearing qualities. In the poem “Nearly Risen,” Davis writes of a woman who “told the story of kittens in a burlap sack / a kid on the bench they were thrown to,” a woman who “Cried hard over the missing kittens.” Similar to some of the other poems, Davis depicts a moment of tenderness at just the right time, no matter how bizarre his characters are, and no matter how many twists and turns his stanzas take. Davis, like other Chicago poets before him, makes space for all the city’s residents, including the oddballs and outcasts. he picked small shards from his scalp, matted with blood. Davis dives deep into emotional scars and memories, but even in ugly situations, his lines make the reader feel for the troubled characters. A few lines after the smashed bottle image, there is “a flash of recollection,” “of backseat indiscretion, impulse revisited.” Those few lines are haunting and make the character’s sense of longing that much more understandable and relatable. Davis is just as good presenting places as he is people, while evoking mood. In “The Way She Shakes,” he describes what sounds like the loneliest bachelor pad in Chicago, an apartment that has “sticky floors,” mute streetlights, lack of heat, an empty glass stained with wine, and an occupant who returns “whiskey weary,” fumbling with his keys at the door. The apartment is just as alive, yet sad as some of the other characters in the collection. As good as the poet is at writing narratives, he is just as well-equipped to write a fine lyric poem, as shown through “Liminal,” “Glaring,” and other poems with tight lines that lead to an epiphany or ask the reader to ponder some of poetry’s age-old questions. Davis is just as versatile in subject matter. Though many of the poems center around characters of the city, Davis also references and rewrites classic myths and gods, including Poseidon and Ares. “In an Episode of War,” he turns the war god into a whiskey-slugging man who rants about advertising in baseball. It is difficult to sharply nitpick Davis’ debut full-length collection. It would have been interesting to see the poet employ a few other forms and perhaps shorten the collection by a few poems, but it is a fine collection. Like poets that came before him, Davis sees the beauty in Chicago’s outcasts, from the basic panhandler to the musician on the street, and as an editor, he too understands the importance of supporting new voices and giving back to the community. Brian Fanelli’s poetry has been nominated for a Pushcart Prize and has appeared or is forthcoming in Main Street Rag, Spillway, Boston Literary Magazine, North Chicago Review, Oklahoma Review, and elsewhere. He is the author of the chapbook Front Man (Big Table Publishing), and the full-length collection All That Remains, forthcoming soon from Unbound Content.